Have you ever stumbled upon something and instantly recognized it as genius? This happened to me last night. I have no idea how I found this video of Simon Sinek’s TED Talk “How Great Leaders Inspire Action,” but it rocked my world. I seem to be late to the party; apparently, this TED Talk is the third most viewed video on TED.com with almost 20.6 million views. If you haven’t seen it yet, go watch it now. It’s 18 minutes of genius. It will totally change the way you view your role as a leader. Now, everyone understands what they do, every minute of every day. The outer layer of our brains, the neocortex, handles this level of thought. This part of the brain understands language, rational thought, and analysis. Why does this distinction matter to leaders? Sinek has spent years researching what allows some leaders to be immensely successful, while others who are equally - or better - qualified fail to inspire action. When most leaders try to inspire people to do something - vote for them, work for them, endorse them, or follow them - they communicate to the outside of the brain. 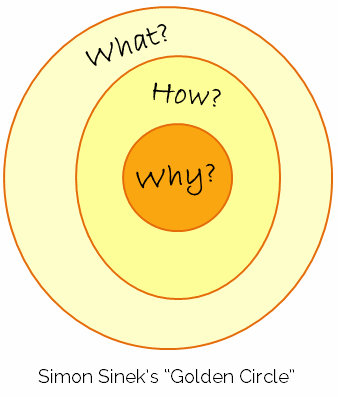 They start with what, follow that with how, and never quite make it to why. They’re well-designed and easy to use. Not very convincing, right? This message starts with what they do, goes into how they do it, and then stops. It never reaches the emotional center of the brain. A company who touted this message simply wouldn’t become an industry leader. This is the message that gets people to stand in line for 6 hours waiting to buy the first round of new iPhones. This is the message that gets people to spend twice as much on a Mac as they do on a PC. The fact that they make computers and phones is secondary to the fact of why they do it. This is the message of an industry leader. Most of us talk about continuous improvement from the standpoint of “what.” We focus on our Rapid Improvement Events, kaizen, and reducing waste, without talking about why these matter. It’s no wonder we have trouble getting people to invest in the idea of continuous improvement - we’re not getting emotional buy in from anyone. Think about the work of Dr. Martin Luther King Jr, another of Sinek’s examples in this TED Talk. Dr. King was one of the greatest leaders this country has ever seen. He is the face of the civil rights movement, and played a significant role in bringing racial equality to our nation. Do you know how he did it? He didn’t tell people what to do to achieve racial equality - he shared his belief in why it matters. He made an emotional connection that no other leader was capable of. Dr. King didn’t tell people what to do, or how to do it. He inspired them by selling why to do it. Lead with inspiration, not persuasion. As a leader, it’s first and foremost your job to communicate with your staff and executives not what continuous improvement is, or how you plan to achieve such a culture, but rather, why your organization needs this cultural transformation. You need to create an army of believers - and you’ll do it by sharing your own beliefs. Sinek cites the Wright brothers as a striking example of when this method of leadership works. Orville and Wilbur worked to master controlled human flight at a time when everyone else was doing the same, and they succeeded on December 17, 1903. They competed against many others who were more poised to succeed, with more education, more money, and more fame. So how did they win? Sinek poses that they won because they built a team of people who believed what they believed. People didn’t work for them for money, or for fame - they worked because they had a common dream. They worked with their blood, sweat, and tears for the Wright brothers - and in the end, that’s what mattered. They weren’t motivated by what - the money, the glory, their careers - they were motivated by why. They succeeded because they believed in the dream. Imagine what your team could do if you led like the Wright brothers. Imagine what would happen if your staff didn’t continuously improve because you told them they have to, but rather, because they believed in the mission. Now imagine if your senior leaders believed in that mission, too. Create an army of believers out of your staff and your leadership, and you’ve created a culture of continuous improvement that will have a monumental impact on the organization. Was Sinek's idea as huge to you as it was to me? Spend some time thinking about why you do what you do. What do you believe in, why does it matter? Follow Sinek's advice, and you’ll spend the rest of your career building your army of believers. Tell me about your "why" in the comments! I'd love to see what inspires you.